This article is about the language. For the people of Luxembourg, see Luxembourgers. Luxembourgish, Luxemburgish (/ˈlʌksəmbɜːrɡɪʃ/ LUK-səm-bur-gish), Letzeburgesch (/ˌlɛts(ə)bɜːrˈɡɛʃ/ LETS(-ə)-bur-GESH or /ˈlɛts(ə)bɜːrɡɪʃ/ LETS(-ə)-bur-gish) (Luxembourgish: Lëtzebuergesch), or Luxembourgian is a West Germanic language that is spoken mainly in Luxembourg. About 390,000 people speak Luxembourgish worldwide. The area where Luxembourgish (pale violet) and other dialects of Moselle Franconian (medium purple) are spoken. The internal isogloss for words meaning "of", i.e. op and of is also shown (Standard German: auf). A variety of the Moselle Franconian dialect group, Luxembourgish has similarities with other varieties of High German and the wider group of West Germanic languages. The status of Luxembourgish as an official language in Luxembourg and the existence there of a regulatory body, has removed Luxembourgish, at least in part, from the domain of Standard German, its traditional Dachsprache. Luxembourgish belongs to the West Central German group of High German languages and is the primary example of a Moselle Franconian language. Luxembourgish is the national language of Luxembourg and one of three administrative languages, alongside French and German. In Luxembourg, 50.9% of citizens can speak Luxembourgish. Luxembourgish is also spoken in the Arelerland region of Belgium (part of the Province of Luxembourg) and in small parts of Lorraine in France. In the German Eifel and Hunsrück regions, similar local Moselle Franconian dialects of German are spoken. The language is also spoken by a few descendants of Luxembourg immigrants in the United States and Canada. Additionally, in the German Eifel and Hunsrück regions, similar local Moselle Franconian dialects of German are spoken. Other Moselle Franconian dialects are spoken by ethnic Germans long settled in Transylvania, Romania (Siebenbürgen). Moselle Franconian dialects outside the Luxembourg state border tend to have far fewer French loan words, and these mostly remain from the French Revolution. 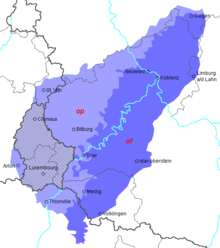 There are several distinct dialect forms of Luxembourgish including Areler (from Arlon), Eechternoacher (Echternach), Kliärrwer (Clervaux), Miseler (Moselle), Stater (Luxembourg), Veiner (Vianden), Minetter (Southern Luxembourg) and Weelzer (Wiltz). Further small vocabulary differences may be seen even between small villages. Increasing mobility of the population and the dissemination of the language through mass media such as radio and television are leading to a gradual standardisation towards a "Standard Luxembourgish" through the process of koineization. There is no distinct geographic boundary between the use of Luxembourgish and the use of other closely related High German dialects (for example Lorraine Franconian); it instead forms a dialect continuum of gradual change. Spoken Luxembourgish is relatively hard to understand for speakers of German who are generally not familiar with Moselle Franconian dialects (or at least other West Central German dialects). However, they can usually read the language to some degree. For those Germans familiar with Moselle Franconian dialects, it is relatively easy to understand and speak Luxembourgish as far as the everyday vocabulary is concerned. However, the large number of French loanwords in Luxembourgish may hamper communication about certain topics, or with certain speakers (who use many French loanwords). There is no intelligibility between Luxembourgish and French or any of the Romance dialects spoken in the adjacent parts of Belgium and France. Erna Hennicot-Schoepges, President of the Christian Social People's Party of Luxembourg 1995–2003, was active in promoting the language beyond Luxembourg's borders. A number of proposals for standardising the orthography of Luxembourgish can be documented, going back to the middle of the 19th century. There was no officially recognised system, however, until the adoption of the "OLO" (ofizjel lezebuurjer ortografi) on 5 June 1946. This orthography provided a system for speakers of all varieties of Luxembourgish to transcribe words the way they pronounced them, rather than imposing a single, standard spelling for the words of the language. The rules explicitly rejected certain elements of German orthography (e.g., the use of "ä" and "ö", the capitalisation of nouns). Similarly, new principles were adopted for the spelling of French loanwords. This proposed orthography, so different from existing "foreign" standards that people were already familiar with, did not enjoy widespread approval. A more successful standard eventually emerged from the work of the committee of specialists charged with the task of creating the Luxemburger Wörterbuch, published in 5 volumes between 1950 and 1977. The orthographic conventions adopted in this decades-long project, set out in Bruch (1955), provided the basis of the standard orthography that became official on 10 October 1975. Modifications to this standard were proposed by the Conseil permanent de la langue luxembourgeoise and adopted officially in the spelling reform of 30 July 1999. A detailed explanation of current practice for Luxembourgish can be found in Schanen & Lulling (2003). French: Boîte, Enquête, Piqûre, etc. German: blöd, Bühn (but German Bühne), etc. wann ech ginn "when I go", but wa mer ginn "when we go"
fënnefandrësseg "thirty-five", but fënnefavéierzeg "forty-five". The consonant inventory of Luxembourgish is quite similar to that of Standard German. /p͡f/ occurs only in loanwords from Standard German. Just as among many native German-speakers, it tends to be simplified to [f] word-initially. For example, Pflicht ('obligation') is pronounced [fliɕt], or in careful speech [p͡fliɕt]. /v/ is realized as [w] when it occurs after /k, t͡s, ʃ/, e.g. zwee [t͡sweː] ('two'). /d͡z/ appears only in a few words, such as spadséieren /ʃpɑˈd͡zəɪ̯eʀen/ ('to go for a walk'). /d͡ʒ/ occurs only in loanwords from English. /χ, ʁ/ have two types of allophones: alveolo-palatal [ɕ, ʑ] and uvular [χ, ʁ]. The latter occur before back vowels, whereas the former occur in all other positions. The [ʑ] allophone appears only in a few words. Note that an increasing number of speakers do not distinguish between the alveolo-palatal allophones of /χ, ʁ/ and the postalveolar phonemes /ʃ, ʒ/. Younger speakers tend to vocalize the word-final /ʀ/ to a central vowel [ə] or [ɐ]. Before velars: close-mid front unrounded [e], which for some speakers may be open-mid [ɛ] - this is especially frequent before /ʀ/. Exactly the same variation applies to /o/ (except that it is back rounded). All other positions: mid central vowel, more often slightly rounded [ə̹] than unrounded [ə̜]. Phonetically, the long mid vowels /eː, oː/ are raised close-mid (near-close) [e̝ː, o̝ː], and may even overlap with /iː, uː/. /eː/ before /ʀ/ is realized as [ɛː]. /aː/ is the long variant of /ɑ/, not /æ/ (which does not have a long counterpart). /oɪ/ appears only in loanwords from Standard German. The first elements of /æːɪ, æːʊ/ may be phonetically short [æ] in fast speech or in unstressed syllables. The /æːɪ–ɑɪ/ and /æːʊ–ɑʊ/ contrasts arose from the former lexical tone contrast; the shorter /ɑɪ, ɑʊ/ were used in words with Accent 1, whereas the lengthened /æːɪ, æːʊ/ were used in words with Accent 2. Luxembourgish has three genders (masculine, feminine, and neuter), and has three cases (nominative, accusative, and dative). These are marked morphologically on determiners and pronouns. As in German, there is no morphological gender distinction in the plural. As seen above, Luxembourgish has plural forms of en ("a, an"), namely eng in the nominative/accusative and engen in the dative. They are not used as indefinite articles, which—as in German and English—do not exist in the plural, but they do occur in the compound pronouns wéi en ("what, which") and sou en ("such"). For example: wéi eng Saachen ("what things"); sou eng Saachen ("such things"). Moreover, they are used before numbers to express an estimation: eng 30.000 Spectateuren ("some 30,000 spectators"). Distinct nominative forms survive in a few nominal phrases such as der Däiwel ("the devil") and eiser Herrgott ("our Lord"). Rare examples of the genitive are also found: Enn des Mounts ("end of the month"), Ufanks der Woch ("at the beginning of the week"). The functions of the genitive are normally expressed using a combination of the dative and a possessive determiner: e.g. dem Mann säi Buch (lit. "to the man his book", i.e. "the man's book"). This is known as a periphrastic genitive, and is a phenomenon also commonly seen in dialectal and colloquial German, and in Dutch. Curiously, the definite article changes with the use of an attributive adjective: feminine d' goes to déi (or di), neuter d' goes to dat, and plural d' changes to déi. Luxembourgish has borrowed many French words. For example, the name for a bus driver is Buschauffeur (also Dutch and Swiss German), which would be Busfahrer in German and chauffeur de bus in French. Some words are different from Standard German but have equivalents in German dialects. An example is Gromperen (potatoes – German: Kartoffeln). Other words are exclusive to Luxembourgish. Listen to the words below. (help·info) Note: Words spoken in sound clip do not reflect all words on this list. Misschien, wellicht Vläicht. Vielleicht. Maybe. Hallo. (also Moi in the north) Moien. Hallo. (also Moin in the north) Hello. Goedemorgen. Gudde Moien. Guten Morgen. Good Morning. Goedendag. or Goedemiddag. Gudde Mëtteg. Guten Tag. Good Afternoon. Goedenavond. Gudden Owend. Guten Abend. Good Evening. Tot ziens. Äddi. Auf Wiedersehen. Goodbye. Dank u. or Merci. (in Flanders) Merci. Danke. Thank you. Ik weet het niet. Ech weess net. Ich weiß nicht. I don't know. Ik versta het niet. Ech verstinn net. Ich verstehe nicht. I don't understand. Excuseer mij. or Wablief? (in Flanders) Watgelift? or Entschëllegt? Entschuldigung? Excuse me? Slagerszoon. Metzleschjong. Metzgersohn. / Metzgerjunge. Butcher's son. Spreek je Duits/Frans/Engels? Schwätzt dir Däitsch/Franséisch/Englesch? Sprichst du Deutsch/Französisch/Englisch? Do you speak German/French/English? Hoe heet je? Wéi heeschs du? Wie heißt du? What is your name? Hoe gaat het? Wéi geet et? Wie geht’s? How are you? Thuis. Heem. zu Hause. / Heim. Home. Neologisms in Luxembourgish include both entirely new words, and the attachment of new meanings to old words in everyday speech. The most recent neologisms come from the English language in the fields of telecommunications, computer science, and the Internet. Between 2000 and 2002, Luxembourgish linguist Jérôme Lulling compiled a lexical database of 125,000 word forms as the basis for the very first Luxembourgish spellchecker (Projet C.ORT.IN.A). The LaF (Lëtzebuergesch als Friemsprooch – Luxembourgish as a Foreign Language) is a set of four language proficiency certifications for Luxembourgish and follows the ALTE framework of language examination standards. The tests are administered by the Institut National des Langues Luxembourg. The "Centre for Luxembourg Studies" at the University of Sheffield was founded in 1995 on the initiative of Professor Gerald Newton. It is supported by the government of Luxembourg which funds an endowed chair in Luxembourg Studies at the university. The first class of students to study the language outside of the country as undergraduate students began their studies at the 'Centre for Luxembourg Studies' at Sheffield in the academic year 2011–2012. ^ Note that the letter ⟨é⟩ today represents the same sound as ⟨ë⟩ before ⟨ch⟩. The ostensibly inconsistent spelling ⟨é⟩ is based on the traditional, now widely obsolete pronunciation of the sound represented by ⟨ch⟩ as a palatal [ç]. As this consonant is pronounced further back in the mouth, it triggered the use of the front allophone of /e/ (that is [e]) as is the case before the velars (/k, ŋ/). Since the more forward alveolo-palatal [ɕ] has replaced the palatal [ç] for almost all speakers, the allophone [ə] is used as before any non-velar consonant. So the word mécht ('[he] makes'), which is now pronounced [məɕt], used to be pronounced [meçt]; this is the reason for the spelling. The spelling ⟨mëcht⟩, which reflects the contemporary pronunciation, is not standard. ^ In the standard orthography, /ɑʊ̯/ and /æːʊ̯/ are not distinguished; this is due to the conflicting use of ⟨äu⟩ in German words to indicate /oɪ̯/. ^ a b "Le nombre de locuteurs du luxembourgeois revu à la hausse" (PDF). Retrieved 8 November 2012. ^ Hammarström, Harald; Forkel, Robert; Haspelmath, Martin, eds. (2017). "Moselle Franconian". Glottolog 3.0. Jena, Germany: Max Planck Institute for the Science of Human History. ^ a b "Luxemburgish – definition of Luxemburgish in English from the Oxford dictionary". Retrieved 21 March 2015. ^ a b "Letzeburgesch – definition of Luxembourgish in English from the Oxford dictionary". Retrieved 21 March 2015. Kas Deprez (1997). Michael G. Clyne, ed. "Diets, Nederlands, Nederduits, Hollands, Vlaams, Belgisch-Nederlands". Undoing and Redoing Corpus Planning. Walter de Gruyter: 249. ISBN 9783110155099. Bengt Skoog (1983). Immigrants and Cultural Development in European Towns. Council for Cultural Co-operation. p. 51. ISBN 9789287102393. National Geographic Society (2005). Our Country's Regions: Outline maps. Macmillan/McGraw-Hill. p. 59. ISBN 9780021496259. ^ Mémorial A no. 16 (27 February 1984), pp. 196–7: "Loi du 24 février 1984 sur le régime des langues". ^ Hausemer, Georges. Luxemburger Lexikon - Das Großherzogtum von A-Z. ^ Mémorial A no. 40 (7 September 1946), pp. 637–41: "Arrêté ministériel du 5 juin 1946 portant fixation d'un système officiel d'orthographe luxembourgeois"
^ Mémorial B no. 68 (16 November 1976), pp. 1365–90: "Arrêté ministériel du 10 octobre 1975 portant réforme du système officiel d'orthographe luxembourgeoise". ^ Mémorial A no. 112 (11 August 1999), pp. 2040–8: "Règlement grand-ducal du 30 juillet 1999 portant réforme du système officiel d'orthographe luxembourgeoise". ^ a b Gilles & Trouvain (2013), p. 67. ^ a b c d e Gilles & Trouvain (2013), p. 72. ^ Gilles & Trouvain (2013), p. 69. ^ a b Gilles & Trouvain (2013), p. 68. ^ Gilles & Trouvain (2013), pp. 68–69. ^ a b c d e f Gilles & Trouvain (2013), p. 70. ^ Trouvain & Gilles (2009), p. 75. ^ a b Gilles & Trouvain (2013), p. 71. ^ Trouvain & Gilles (2009), p. 72. ^ "Centre for Luxembourg Studies". Retrieved 11 September 2011. GILLES, Peter (1998). "Die Emanzipation des Lëtzebuergeschen aus dem Gefüge der deutschen Mundarten". Zeitschrift für deutsche Philologie. 117: 20–35. Wikimedia Commons has media related to Luxembourgish language.